The oil industry was just beginning to thrive when, in 1942, Cecil Guinn moved his family from Monroe, Louisiana to begin a career in that state’s famous oilfield in Jennings. When WWII broke out, he, and his identical twin brother Carl, wanted to sign up for active duty. Carl ended up in the Air Force; however, due to Cecil’s perforated ear drum, he could not pass his entrance physical. He was upset about not being able to fight for his country, but another brother Earl, pastor at the First Baptist Church in Jennings, consoled Cecil, convincing him that the war efforts needed oil to support tanks and planes, and that the oilfield would make him feel a part of the war effort. Earl found Cecil a job with National Supply where he worked for five years in Jennings before being transferred to Houma. While in Houma, he accepted a sales position with Garret Oil Tools, which later became Otis Oil Tools. After spending three years in Houma, he was transferred to Lafayette by Otis. It was in Lafayette that he saw an opportunity as an entrepreneur to own his own business. In 1957, Cecil bought his first workover rig and named his business Pelican Well Service after Louisiana’s state bird. A workover rig, unlike a drilling rig, is more mobile and much smaller. While drilling rigs drill new wells for oil companies in hopes of finding oil or gas, workover rigs work on the oil companies’ existing wells that, for one reason or another, has either declined in production of oil and gas, or the oil or gas has totally stopped flowing. There are several types of well site jobs that workover rigs perform: workovers, completions, rod jobs, re-entries, sidetracks, and plug and abandonments. Cecil and Virginia Guinn with their grandson, Mike Moncla at the Pelican Well Service office in 1972. Virginia Guinn with a brand new 1,000 hp twenty-four hour workover rig on display at the 1981 Louisiana Gulf Coast Oil Exposition (LAGCOE). In 1977, Cecil was diagnosed with cancer and passed away shortly thereafter. His wife, Virginia took over as president of the company with, Charlie Moncla moving up to vice president. From 1977-1987, Virginia grew Pelican to four 1,000 hp 24-hour rigs, one 24-hour barge rig, 11 daylight rigs and two swab trucks, and employed 200 at its highest point. 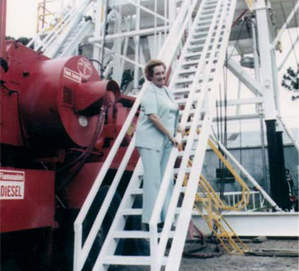 Virginia Guinn was a true pioneer as a in the oil business, running a rig company through the ups-and-downs of the late 70s, 80s and early 90s before selling the rigs in 1992. Charlie Moncla on the cover of Well Servicing magazine as he served as the 2002 national president of the Association of Energy Service Companies. In 1984, Charlie Moncla went out on his own buying one rig, and by his tenth year in business, was running seven rigs. Charlie never liked the connotation of Cecil’s janitor example, so he passed down to his children that, “we are the doctors of the oilfield, and our rigs fix broken and sick wells!” In 1993, Charlie hired his son Mike to handle sales and marketing. Three years later, and after adding three more rigs, Charlie hired his brother, Buck, and his second son, Marc (Spook). For the next 11 years (1996-2007) Moncla added 43 rigs. During that time, Charlie also added his brother Cain, son Matt, and nephews, Andrew and Ben. It became a running joke that every time Charlie added a new family member to the company; he had to add four or five rigs to pay for their cost. Also, in the same fashion as Cecil had done to Charlie, each family member had to work a week on each rig to learn the equipment and meet the entire rig personnel. The family members that came later than others jokingly complained that they had to work longer on the rigs, since so many more rigs had been added. There were a total of eight Monclas in the business, but all employees were considered family, to which the Moncla successes can be attributed. During those 11 years of growth, Moncla Companies made 11 acquisitions of local companies, and became the largest independent workover rig company in the United States. Moncla was headquartered in Lafayette, with offices in Sour Lake, Texas and Sandersville, Mississippi. The Sour Lake yard was acquired through the purchase of Petroleum Well Service, and the yard covered the Texas Railroad District Three area. Through several acquisitions, Moncla became the largest workover company in Mississippi, marketing 14 rigs out of the Sandersville yard and covering the Mississippi, Alabama, and Florida areas. In Louisiana, Moncla was known for its fleet of 1,000 hp rigs that handled deep workovers, and their ability to work smaller daylight rigs on a 24-hour basis. Through the years Moncla also accumulated 40 rig hauling trucks that moved rig equipment from well-to-well. The company also diversified into other facets of the oilfield as part of that growth. The demand to put land rigs on keyway barges for customers was tremendous, in some years having five land rigs on barges the entire year. So, in 2001 they constructed and christened their first fully fledged 24-hour inland barge rig, The Stingray, which accompanied The Moccasin, a daylight barge rig Moncla acquired from the acquisition of Harris Well Service (Harris had been a competitor since the Pelican days of the 1950s). By 2007, this subsidiary, Moncla Marine, also became the largest in the U.S. with eight workover barge rigs, all named for indigenous reptiles or fish of south Louisiana. Perhaps the oddest job in the history of the workovers! Moncla Rig #8 in 1993 in a Baton Rouge plant atop a coke tower 150 feet high. In 2003, Moncla acquired Louisiana Swabbing that catapulted them into the swabbing business. This subsidiary was named Brother’s Oilfield Service & Supply (BOSS), and it furnished swab trucks, tubing testing units, hot oil trucks, anchor trucks, power swivel rentals and mud system rentals. In 2005, the company also started Moncla Drilling and converted two of their 24-hour workover rigs into drilling rigs and signed long-term contracts in the Barnett Shale near Fort Worth, Texas and southwest Mississippi. Moncla’s yard on I-10 north near the University exit in Lafayette, was a familiar landmark with a huge American flag painted on the roof of the trucking building. It was at this twenty-acre facility that Moncla drilled a training well down to 4,000 feet, and began a new hire training school called the “U of Krewe”. Here, hundreds of new employees were able to learn, in not only a classroom setting, but in actual on-the-job training, the safest and best way to be a part of a rig crew. Moncla’s most important asset was its loyal employees, many who dated back to the Pelican days. It was only by the expertise of the employees that Moncla was able to handle the many high profile jobs from sidetracking wells in the Florida Everglades, to high pressure completions 100-yards away from I-10, or from working for the U.S. government at the strategic petroleum reserve, to working in environmentally sensitive Federal Game Reserves. Due to the proximity to the Mississippi River, several large industrial plants transport products via ships from the Baton Rouge and New Orleans areas. These plants also have injection wells and storage wells that commonly have to be tested and worked on by workover rigs. Probably the oddest job in the history of workover rigs was done by Moncla in the early 90s when a fire at a Baton Rouge plant melted away the standard derricks atop of the 150-foot coke battery (see photograph). The Moncla rig was lifted by crane, set on a platform above the battery, and used to wash out these batteries, so that the battery could be disassembled and rebuilt for future use. Charlie Moncla Christening The Redfish Barge Rig #106 in 2005 in Abbeville, Louisiana. In 2007, at the peak of Moncla’s growth, the family felt the time was right to sell the business. In November of that year, Moncla sold to Key Energy. Key was the largest workover company in the world at the time, and Moncla’s reputation, its 53 rigs, and its 1,000 employees was a perfect fit to Key Energy’s southeastern U.S. division. Charlie worked for Key in the corporate office in Houston throughout the transition period, while Charlie’s family remained in Lafayette to run Key’s southeastern division. After about two years of working at Key Energy in Lafayette, Mike, Marc, Matt, and Buck approached Key management about buying the barge fleet and the BOSS Company back from Key Energy. Negotiations were concluded and “the Moncla boys” (which is how they were mostly referred) bought back Moncla Marine and BOSS in May of 2010. The third generation had successfully rejuvenated the family workover rig business that their family had been in for nearly six decades. “The rig business is just in our blood”, said Mike Moncla. In the same timeframe as their purchase, the oil industry was suffering through its worst environmental disaster in history, the famous BP Macondo blowout and spill. Luckily, the inland water activity was increased as the Obama administration’s ban on offshore drilling, shifted oil companies’ budgets to inland waters and land projects. “The Moncla Boys” from left to right, Mike, Matt, Marc, and Buck in 2012 at their new facility on the Breaux Bridge Highway. In opportunistic fashion, “The Moncla boys” also went international for the first time in the family’s history sending a drilling rig to Belize, Central America. Learning from their previous experiences in growing a business, the Monclas were soon on the same growth path as before acquiring the barge rig fleet from Tetra Technologies in 2012, adding to Moncla’s fleet as the largest workover barge company in the U.S. In their first two-year span in business, they purchased 10 land rigs at auctions in preparation for getting back into the south Louisiana land market, opening Moncla Workover & Drilling in May of 2012. Also in December of 2012, Moncla diversified into the electric wireline market opening Moncla E-Line Services. Then in 2013, they signed the first long-term contract in their family’s history and entered the offshore platform rig market in Alaska, creating Moncla Offshore. The Moncla companies were headquartered on the Breaux Bridge Highway.